Complete Buying Guide for Roman Shades | BlindsOnLine.com - BlindsOnLine.com Inc. Although they may have recently been overshadowed by new age, light-blocking window blinds and other treatments, roman shades are still a hit among homeowners across the United States - and for good reason. Roman shades are designed using characteristically Roman-esque column shapes and feature a cord (there are also cordless options) that allows the shades to rise and fall, just like the empire by that same name. It is even rumored that the first roman shades were actually used during the time of the ancient Romans. One of the biggest advantages to the roman shades is that they are an extremely inexpensive investment that may even improve the overall value of your home. Some websites even go as far as to help individuals create their own roman shades. Although making your own shades may be the perfect option for broke college students, the quality almost always speaks for itself. Unlike mere drapes or blinds, roman shades have a unique style that stands the test of time. While other window treatments have gone in and out of style, roman shades have been around for decades and will be for many more. 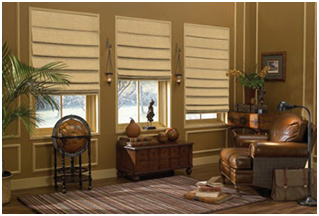 Because roman blinds have a fabric that covers them, choosing a durable cloth can increase the life of your shade. Depending on the type of fabric that you use, some roman shades have also been recently improved to offer homeowners light/dark filtering options. Other more traditional options are ideal for homeowners who want a soft light to touch and enter their homes. As mentioned earlier, it is not too difficult to create your own roman shade. As long as you are a talented seamstress or seamster, you may be able to use and reuse your roman shades by simply updating the fabric as styles and tastes change. In addition to endless fabric options, roman shades also come in 4 different styles: flat, looped, balloon, and dog-eared. At BlindsOnLine.com, we give contractors, designers, and homeowners the tools they need to install their own roman shades (and window treatments of all sorts). At BlindsOnLine.com, we try to make sure that all of our products are up to date with the latest technology. Don’t be fooled; despite their traditional allure, all of our roman shade fabrics have been designed with a standard light filtering lining, which will protect your new product from fading and the harmful effects of UV rays. Please note that you may need to follow slightly different instructions depending on the type of roman shade that you will be installing. The above are directions for inside mount installation. Armed with the above knowledge, you should feel confident to make an educated decision regarding whether roman shades are the right window treatment for your project. Shop for roman blinds online today and browse our entire BlindsOnLine.com inventory by visiting our website to find your perfect window treatment.